But obviously that’s a pretty strong claim to make, because 5.3% daily is a BIG amount of interest… So what’s the deal here – is it actually legit or is MineTech Farm a scam that’ll just see you parted from your cash? What Exactly Is MineTech Farm? MineTech Farm claims to be a UK registered cryptocurrency mining operation and alongside the whole alleged mining process they claim to provide you with the ability to invest & earn whopping ROI’s from their platform. This might initially sound quite convincing but it doesn’t seem to hold true. The domain for the website was actually only registered on the 13th of February & the company MineTech Farm LTD was only incorporated on the 15th February 2018. None of the dates add up & it all seems very suspicious. The other worrying thing is how much they stress that they’re based in the UK – it seems like they’re overcompensating. The reason I say this is worrying is because many scams pretend to reside in the UK to try & gain peoples trust – Ryna Holdings a scam I recently exposed did the exact same thing. 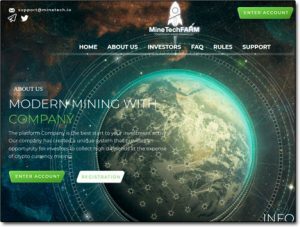 The truth is that it’s actually quite easy to setup a UK company and doing so doesn’t prove anything’s legit, or that the company even actually resides in the UK at all – and the fact that MineTech Farm actually state on their website “Our activity is absolutely legal” rings massive alarm bells. Plus, if they do actually reside in the UK as they claim then they should have a license & their license number should be prominently displayed on their website. It’s a serious offence for a company operating within the investment industry not to display license details on their website so a company that actually had a license would make sure it was well displayed. A license would likely prove the company was legit – an incorporation certificate (which MineTech Farm shows you) does not. How Does MineTech Farm LTD Work? Okay so as mentioned towards the start of this review MineTech Farm claim to have a mining operation. In case you don’t know this is basically an operation through which they generate cryptocurrency coins. I won’t get too deep into it all, but basically MineTech Farm claim to handle all this side of things, and they claim to provide you with a way to profit from the mining without actually having to do any of it yourself. Sadly though there’s absolutely no proof of a legitimate mining operation, and when you couple that with the fact that MineTech Farm push a recruitment program through which you can earn “extra commissions” the whole thing starts to look like a big fat Ponzi scheme. And this wouldn’t be the first cryptocurrency mining Ponzi scheme I’ve come across either… I’ve already seen several others, like the Power Mining Pool & some like USI Tech that have been forced to closed down. Basically these companies pretend to have a mining operation going on but in reality they’re just faking it all to hide what’s really going on. The money that’s getting paid out to members isn’t coming from mining at all – it’s just coming straight from the new investors that are buying in. So obviously the company will be totally unsustainable & eventually it will collapse, leaving people parted from their investments. These things are only really designed for the creators to make money. Sure, the very first people who get in super early might make some money back too but everybody else will likely only end up losing money rather than making it. How Much Can You Earn With MineTech Farm? So, to get started with MineTech Farm you’ll need to invest a minimum of $10 USD or $50 in BTC. They have 3 investment packages in total & this investment amount will get you eligible to participate in package number 1. You can invest between $10 & $2,000 into package 1 & it will see you earning a daily interest of 4.7% for 30 days. Package 2 requires an investment of between $2,001 & $2,000 and this package pays out 5.0% daily interest for 30 days. Finally package 3 requires an investment of between $5,001 and $20,000 and it pays out 5.3% daily interest for 30 days. They want you to keep your cash in, but the longer you keep it in the more chance you have of losing it all. These companies WILL inevitably collapse & sadly there’s no telling when – so if you happen to have your money invested when it does collapse then that means you’ll lose absolutely everything. It might look great & easy but in reality it’s far from it. My Verdict – Is MineTech Farm a Scam? The answer to that in my opinion is definitely yes, I believe MineTech Farm LTD to be nothing but a Ponzi scheme style scam. They make it seem like you can earn money quickly & easily from a legitimate mining operation, but ultimately there’s absolutely no proof of any mining going on at all. The other thing that makes it all seem very suspicious is how they repeatedly flash their company incorporation document at you as if this somehow proves the opportunity to be legit. It 100% does not prove anything. It’s clear to me what’s really going on here with MineTech Farm – the whole thing is just a Ponzi scheme that’s been setup to make the creator wealthy at your expense. Sure the people who get in super early might make a bit of money off the back of it, but most people who join will end up losing everything. To be honest there is just no need to put your money at risk like this because when it comes to making money online there are plenty of legitimate opportunities where you can learn how to make money online without having to risk anything – like Wealthy Affiliate for example. My advice would be for you to avoid MineTech Farm LTD and check that place out instead. Tecademics Review – Is It Another MLM Scam? 2 Responses to "Is MineTech Farm a Scam? 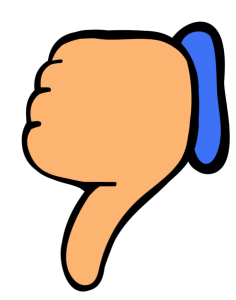 Read My Honest Review Before Joining!" Oh really? I guess they weren’t expecting to get caught out doing that! Thanks for sharing the info.